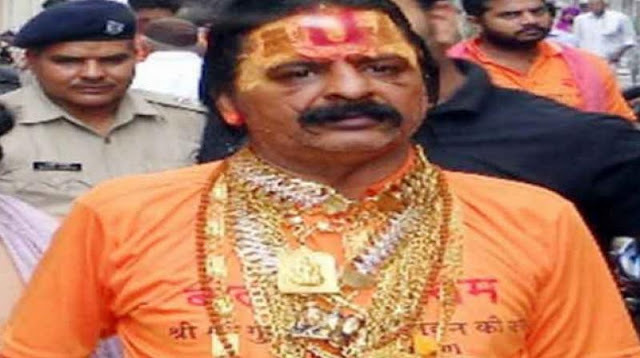 They call him the Golden Baba -- he wears jewellery worth more than Rs 3 crore. And on Saturday, the ascetic from the famous Juna Akhada of Haridwar called on Agra’s top police officer, seeking security. The ascetic had gone to Ujjain’s most talked of Simhastha Kumbh. On his way back to Bareilly he spoke to Agra’s SSP Dr Preetinder Singh, seeking security from the top cop. Adhering to the baba’s request, the police provided him security till Agra. Baba was further advised to seek help from higher authorities in case he wanted security beyond Agra, the cop added. The baba and his cavalcade created quite a stir when they drove into the Agra collectorate. People swarmed him to take selfies. Even complainants coming into the office joined the queue of eager fans waiting to get clicked with the baba, who had chunky chains around his neck and thick bracelets on both his arms .An ascetic and the yellow metal make for an odd combination. A sadhu is expected to shun the pulls of the material world, and live an austere life in search of God.“For me, the gold is devta (deity). I am at peace when I wear it so I have been wearing it since 1972,” he said.